1 of 7 Heat oven to 375 degrees . Pulse one slice bread in food processor until fine crumbs are formed. Stir in wheat germ. Transfer to a 15 x 10 x 1-inch baking pan (push crumbs to one side). 2 of 7 Cut remaining 3 slices of bread into 1/2-inch pieces. Transfer to pan with bread crumbs. Place the walnuts on a second smaller baking sheet. 3 of 7 Spray bread pieces and crumbs with nonstick cooking spray. Season with oregano, salt and pepper. Transfer both baking pans to 375 degrees oven and bake for 10 minutes or until crumbs and nuts are lightly browned, stirring halfway through. Remove pans from oven; increase oven temperature to 400 degrees . 4 of 7 In small bowl, whisk vinegar, mustard and sugar. While whisking, add olive oil in a thin stream. 5 of 7 Cut goat cheese log into 6 equal pieces. Place one goat cheese slice on a paper towel; fold towel over slice. Gently press down to form a disc approximately 2-1/2 inches in diameter. Repeat. 6 of 7 Coat slices with nonstick cooking spray. Dip in crumb mixture. Transfer coated cheese discs to baking sheet. Bake at 400 degrees for 8 minutes or until cheese discs are lightly browned. 7 of 7 While the cheese is warming, toss together salad greens, dressing, walnuts and croutons. 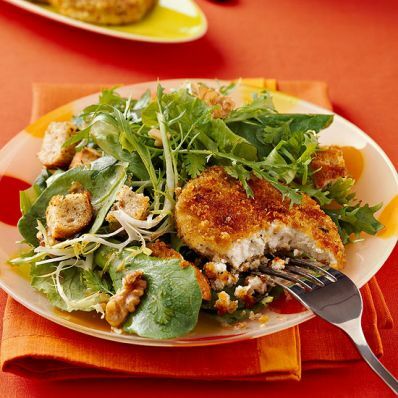 To serve: Divide salad evenly among 6 plates. Top each with 1 goat cheese disc. Per Serving: 385 mg sodium, 3 g fiber, 13 g carb., 32 g Fat, total, 385 kcal cal., 15 g pro., 12 g sat. fat, 37 mg chol.